In the darkness that is winter and the depth that is Lent, behold, Easter draws near when the Light of the World will rise again! 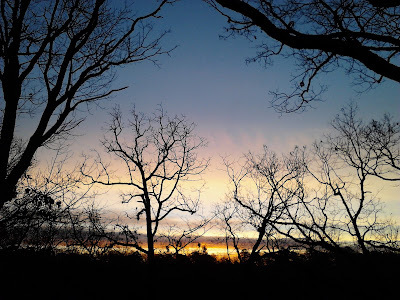 I awoke to a glorious sunrise this morning and was immediately reminded of the imminent coming of Easter and all that resurrection means in this broken world. As a society we are faced with change on a global scale not only in regards to our understanding of community but also in our finally coming to terms with our own culpability in affecting weather patterns and global climate change. We're changing as a country as we struggle to further define our mission, refine our vision, and find our way in a new global understanding while championing compassion, justice, liberty, and happiness for all. We're changing as a society as we continue to embrace greater and greater diversity, expression, and plurality of human beings, made in the image of God. And as that leads us to another reformation in the Church, the various mainstream churches "shuffle the deck" to offer new leadership hoping to either thwart or engage the challenge while seemingly the faithful wonder and wander in the darkness of twilight looking ever forward to the coming light. The internet is ripe with folks who claim we are living in the end times and it's easy to see disaster all around us, in the form of mass shootings, an unhinged would-be American president, and the senseless bombing of communities and the killing of children around the world. It's easy to see disaster in climate change and then end of the earth as we know it, in the form of extreme weather patterns that leave communities and families fractured and in dire need of assistance. Yes, it's easy to see an end is near. To some extent the doomsayers are right of course, this is the end, when the veil is torn asunder and hell is broken loose. However, if this were the end, I mean really the final end, what a pointless graceless world it would, be but it's not. The end that I speak of is the end of the way things were and not the end of things in and of themselves. It is like the end just before the Resurrection, the end before the Easter moment, the end of the dark night just before the return of the morning light, an end that forever changed the world. The kind of end that when you're in it, is black as night and often sobering if not darn right frightening. We are at an end and the new day is dawning, just as the sun arose this morning out of the darkness of last night. The hell that is breaking loose is not unlike Jesus's descent freeing those in hell trapped by the grave. As a world, as a community, and as a church we are being freed once again from the grave, the grave or our own digging. We're on the brink of wonderful possibilities. The world is changing in a big way. Our societies are moving forward even if at times they seem to be regressing, technology is evolving at almost light-speed even as we struggle to catch up with it, and yes, climate change is real but so is our ability to adapt, evolve, change, and thrive. Yes, these times are a changin' and change can be frightening but it is inevitable. How we respond to it is not, however, inevitable, it is a choice. The question is, will we arise from the tomb and dance in the streets with the Resurrected as in times of old, proclaiming the Good News, or will we flee back into the familiar darkness of the grave, hiding from the coming Son and the new day that is dawning? The alchemy of turning wood into iron is pretty easy as it turns out. It's called Rust-Oleum Universal All Surface Flat Metallic Soft Iron Spray Paint and Primer in 1. I really couldn't have asked for a better color. I have a thing about grey. Perhaps you've noticed a pattern evolving here?! The furnishings would now blend with the interior in a minimalistic camouflage of soft iron grey. The putrid color schemes of most RVs and even typical conversion vans have always given my eyes a type of visual nauseousness. Putting a brace between the table and the bunk served three purposes really. The first purpose was to brace both structures in place without bolting them to the vehicle. The second was to provide an effective half-wall behind which to securely stack crates of glass show inventory and supplies. And the third purpose was to keep me from using the back doors as an entrance and egress. The back bumper is short and rounded, a perfect trap just waiting to cause a slip and fall accident. With a little wiggle here and there, it would appear that most everything will fit as I had hoped. Again, my glass show inventory, tools, and supplies will take up more room than my every day living supplies will. I embrace minimalism pretty well. And while that's true, it's also true that I sell trinkets and dust catchers for other folks to clutter up their lives with. Oh the irony of it all but that's life! 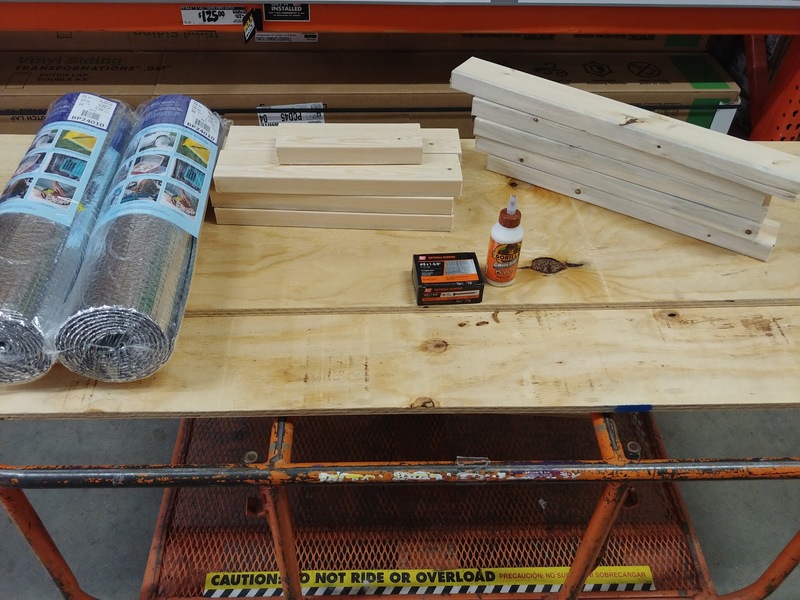 Splinters, Blisters, and a Build-Out, Oh My! Had I known, I think I would have purchased a Class C RV. Armed with a screwdriver, a hammer, some nails, some glue, and leftover paper towels I went to work. Lucky for me, my measurements and the cuts that the helpful guy from Home Depot made were all spot on. That made the job less troublesome to be sure. 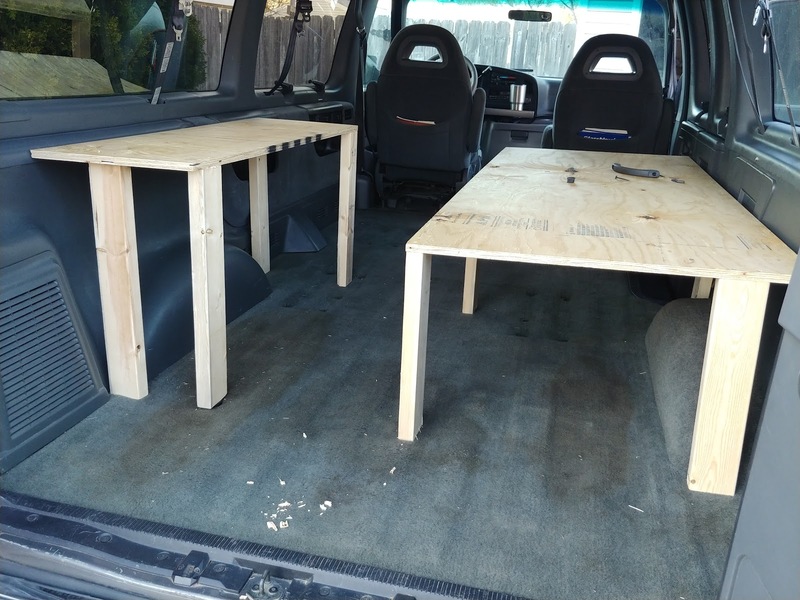 I started with the table. It was smaller and a little less complicated than the bunk and yet it was pretty close to the same kind of structure. 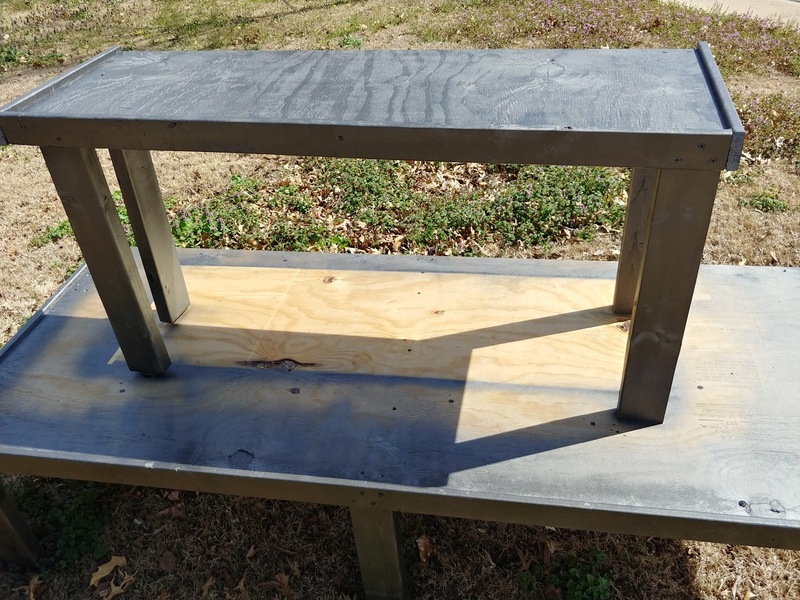 However, if I was going to go through a learning curve, I wanted it to be on a piece of furniture I wouldn't be trying to sleep on at a later date that could fall apart in the middle of the night if I shifted my weight the wrong way. The Gorilla Wood Glue was amazing and money well spent. I suspect it made up for some of my lack of carpentry skills. Only time will tell how well it holds up, or holds me up, as the case may be. 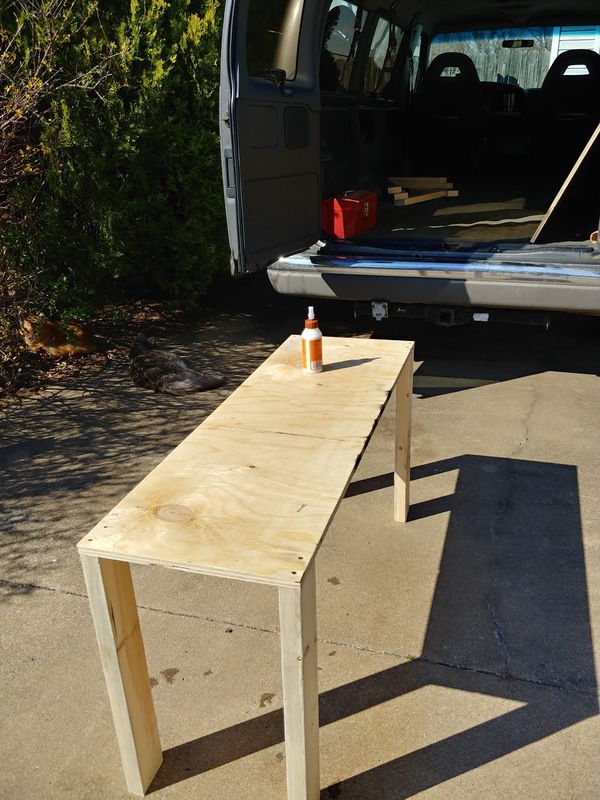 With only a few challenges, the table pretty much went off without a hitch. However, I did see a pattern emerging... One in the palm of my hand from the screwdriver. It was called a blister! The bunk build was larger and more of a challenge in terms of logistics. Due to its size it weighed more and due to my size I wanted at least six legs on it to hold me up. My hands were already tired from screwing around with the screws and blisters were forming. Now that they were basically built I needed to do a little trim work on the furnishings with some 1" X 3" wood trim. This would further secure the pieces and help prevent slippage by anything that might be placed on top of their respective surfaces. My hands were pretty well torn up by this time so I borrowed a rechargeable drill. It made the work go that much faster but let me just say, they sure don't make drill bits the way they use to! All in all, I'm glad I built these items instead of just buying something already created. It is, after all, part of the journey of #VanLife and now I have a good story to go along with my blisters and splinters. More importantly I know that while I'm a glassblower damn it and not a carpenter, I can still turn a screw. Well, after looking around at flea markets, researching various ideas, and literally weighing the options, I've opted to build what I need. Now, how to do that with a manual screwdriver, a hammer, and absolutely no carpentry skills. "Damn it man, I'm a glassblower, not a carpenter!" 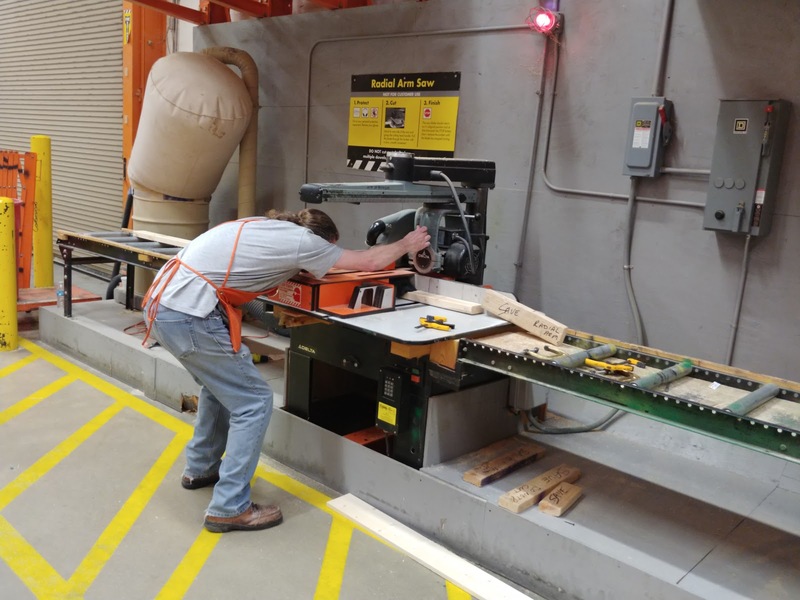 Lucky for me Home Depot cut my wood to order! So all I needed in addition were screws, wood glue, and maybe some paint. 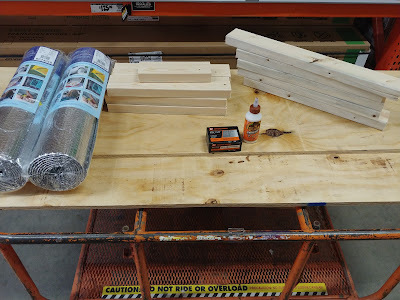 Oh, and some Reflectix insulation for creating blackout panels for the windows. All said and done, I spent about $80 at Home Depot on the build-out and another $20 at Walmart on the spray paint. Now, let's see what I can do with a hammer and a manual screwdriver! 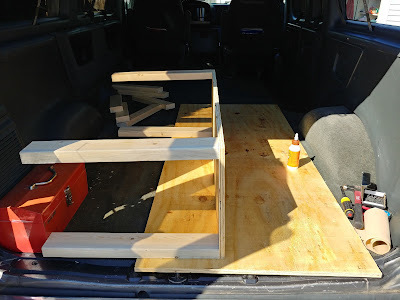 Bed 30" x 75" so cut 31" x 76"
Trim boards 76" + 31" + 31" + 48" +16" + 16"
Deciding what one needs in a vehicle one is going to live in encourages much thought and planning. You have little space to work with and every square inch counts. I don't want to mess with the flooring, the walls or the windows. The Kraken is pretty nice and reasonably well insulated for my purposes, as I don't plan to have him in any extreme hot or cold weather. 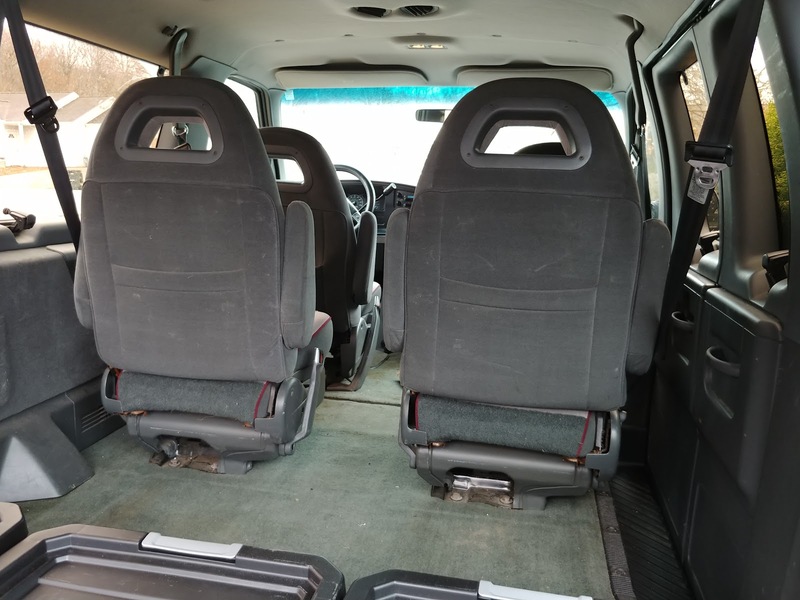 Unlike a typical cargo panel van, the Kraken has windows all around the cargo area because it once was a people moving wagon and those windows offer great visibility which is wonderful to me. I'm essentially looking at a couple of furniture structures to provide some basic support and minimal comfort as I travel. The build-out on the Kraken is going to be very minimalistic. 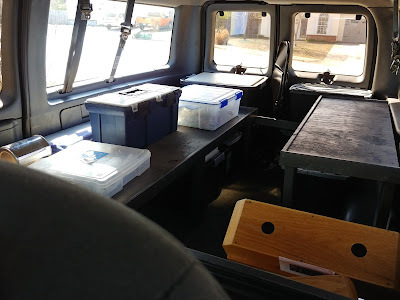 The reality is that I need more space for my glassblowing show: inventory, tools, tent, tables, et cetera than I do for everyday living amenities, at least for now. I've basically decided on a table and a bunk. The table will some day hold a basin and possible water tank and a small camp stove of sorts. The bunk obviously will be my bed. 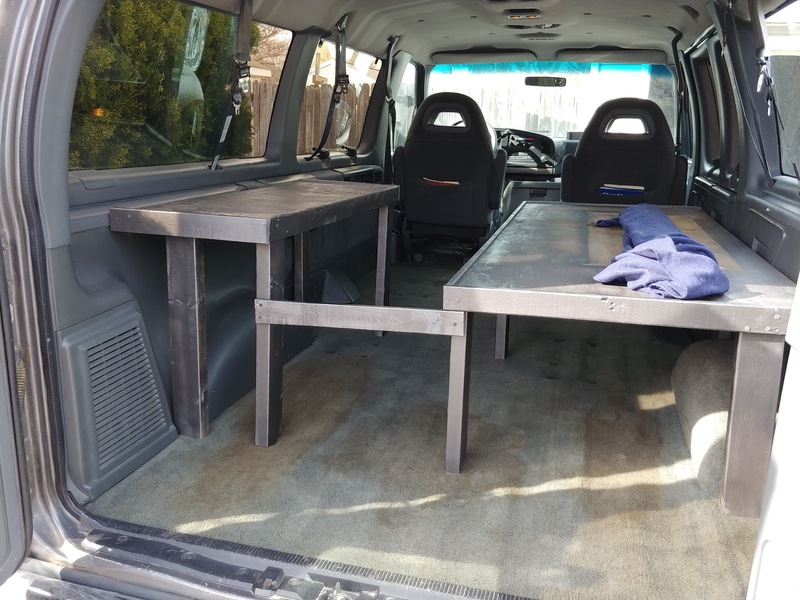 The table will be on one side of the van and the bunk on the other. Both will run along the length of the cargo bay instead of the width. At 6 foot tall, I need a full length mattress on which to sleep but I don't need it to be very wide, maybe a narrow twin will do. During my last two years of minimizing my possessions I have given away many of my tools and am left with the basics. Do you think a screwdriver and hammer will be all I need? Perhaps I should shop the flea markets and find furniture that's already built that will fit my needs. What to do... Time will tell the story. On thing is for sure, the captain's seats in back need to come out! It was cleaning day and also, I would discover, the build date or birthday of the Kraken. He turned 23 today! Happy BuildDay old fellow! The Kraken and I spent the day getting to know one another while I cleaned and tenderly cared for the beast on his special day. 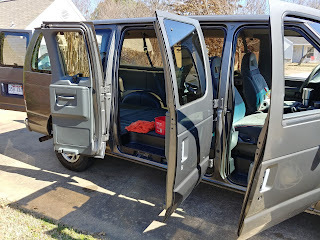 For a 1995 van, he wears his age well. 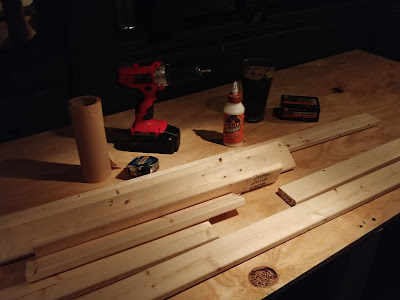 I also did some measuring for the upcoming build out.I am, at this point unsure whether it will be a build out or a buy out from Amazon! Time will tell the story. 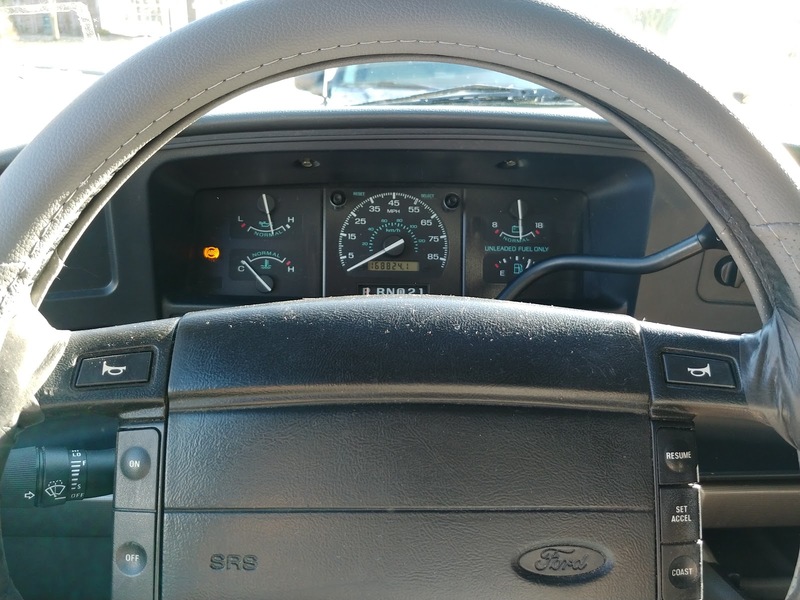 The first thing on the agenda was tending to his worn out steering wheel. Meet the Kraken in his YouTube debut.